Do you feel overwhelmed by the whole idea of financial planning? Are you afraid that good financial advice is out of reach if you don’t have a million dollars or more to invest? Wondering if your financial advisor has your best interest at heart? 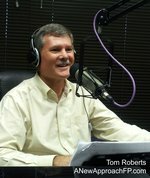 Then you’ll want to listen to this interview with Tom Roberts, founder of A New Approach Financial Planning in Sarasota, Florida. Tom is a Certified Financial Planner™ with diverse training and experience in many areas of financial planning, not just investments. He helps clients find the best use their financial assets to support their personal goals. He looks at all aspects of finances (income, spending, saving, investing, taxes, protecting assets, etc.) to assure they are making the best overall decisions. Following are Tom’s written responses to some questions about financial planning. They are not a transcript of the podcast, however, so it’s a good idea to also listen to the audio of the interview as well. Tom – There are a lot of ways to get financial advice these days and some are better than others. Can you tell us about your background and how you help clients with their financial goals? I have been helping clients solve problems and improve their situations for over 35 years. I started by running technical service groups, helping customers resolve problems and make improvements. After 28 years, it was time to stop traveling and I used these skills along with my financial education to provide advice to individuals. I believe that your assets - financial & human capital - should support your personal goals. I spend most of our Get Acquainted meeting making sure I understand your personal goals. We then take a look at your assets to figure out how they can support your goals. For most of us, investing is an important part of our finances. Many people focus on investing first but, it is more important to get your goals clarified, manage your cash flow - spending & saving - and protect your loved ones first, before you decide how to invest. Investing first is like trying to decorate the house before the foundation is laid. Here's an example; I have a number of clients who are retired or semi-retired. They know their assets may have to support them for 30 years or more. We spend a lot of time determining what they want to do in the future, how much income they will need, what they have available now and how much risk they can afford to take to generate the remainder. Sometimes we need to recalibrate our lifestyle expectations to fit reality. Health, personal expectations and realistic investment returns have an impact on how much income and expenses are reasonable. Once we have clear, achievable, goals that fit your risk profile, we can look at investments. What are the most common concerns that are you are hearing from clients these days? Many people are concerned about how they are going to generate income from their investments without taking a lot of risks. They used to have CDs and bonds paying 5 % or more. When they come due now, they can only get 1 to 2%. People are also very concerned about how they will cover increasing healthcare costs. They see a more complicated and risky future and they want help figuring out the best way for them. With the reduction in company pensions, fewer people have secure income streams covering their basic expenses in retirement. Depending on your circumstances, Social Security may not even cover the basics. Just as diversification of investments can help lower risk when you are growing your nest egg, diversification of income streams can help when you are taking money out. Using a variety of investments can protect the value of your overall portfolio and income. This includes bonds, dividend paying stocks, real estate, MLPs, high yield bonds, international bonds, annuities and variable rate loans. Not all investments are right for everyone. The key is to understand your situation and then create a mix of investments that will work for the longer term. This is not a set it and forget it exercise. You still need to make changes when the environment changes. There are so many ways that financial advisors get paid. Can you explain what hourly fee only financial advice is about and what the advantages can be? Imagine if you could buy only the amount of advice you need and you know what the cost for the advice will be up front. I will tell my clients, up front, how much time I will spend working on the tasks or concerns they identified. Like a dentist, I help people get out of pain and then provide an ongoing program to avoid problems in the future. The advantages? You pay for the time I spend. It doesn't matter how many financial assets you have. What matters is what you want to do with them or what you are working to improve. More complex situations take more time but, if someone is willing to do some of the work, they can lower their costs. The disadvantage is that I don't hide the costs. You know what it is without spending a lot of time teasing out all the fees on your statement. But if you do pull out all the costs, hourly fee only advice is less expensive. Is hourly fee only advice more expensive? If you just want someone to tell you what investment to buy, doing it as a transaction - commissions - will be the least expensive. Initially. But if the investment is not really right for your situation, for example,too risky or it has a high tax cost or it doesn't generate enough income, it could be very expensive. If you do a lot of transactions, it can also get pricey. If you want to get advice based on your situation it takes time to gather the facts, just like a doctor, to make the proper diagnosis and recommendations. If you only want investment advice and compare my charges to commissions or asset based fees, I may be more expensive - especially if you are investing less than $75,000. (If you can find someone will work with you on asset based fees.) I don't focus on providing just investment advice, however, I provide you an affordable overall strategy and help implementing it. On your website it says that you are a fiduciary - your best interest is always my first concern. Isn’t that always the case with a financial advisor? Aren’t they all required to put the client’s financial interests first? The short answer is no, not every financial advisor is required to act as a fiduciary. Just to be clear, a fiduciary is someone who is legally required to put the best interests of another first. When it comes to financial advice, that means assuring that the recommendations are not biased based on the advisor's compensation. Some, those who sell products or work on commissions, are only required to provide "suitable" recommendations or products. That means the products or recommendations may not be the best for the client, just suitable. What makes it even more confusing is that some advisors wear two hats. They act as fiduciaries when making recommendations, such as a financial plan and then sell products under a "suitability standard". The Dodd-Frank bill was to clarify these requirements, however, the regulations have yet to be completed. The best way to protect yourself is to ask if the advisor is a fiduciary, in all interactions with you, and how they are compensated. They should be willing to make this clear and put it in writing. If people are concerned about their finances or want to get their financial life in order, how do they get started? The first step is to get clear about your concerns or what type of help you want. Are you having problems handling debt? Are you looking for help carving out some money each month to start saving? Reducing risk in your investments. Are you moving from full time employment to part time or retirement? Once you have your questions defined, ask people you know and trust for their recommendations. You can also check out national organizations such as the CFP® Board, CFA, NAPFA, FPA for members in your area. Check out their web sites to see if they match your needs and situation. Don't choose someone who works only on investments for wealthy individuals, if you want budgeting help. The Garrett Financial Planning web site has a questions list to help you evaluate potential advisors. Make sure you are clear on how the advisor is paid and all your potential costs. Check everybody out on the SEC site. You can find out if a broker or advisor has had any legal problems or complaints. When you have narrowed the list, interview at least three potential advisors. I would start with a short phone call and follow it up with a face to face Get Acquainted meeting. Most advisors do not charge for this initial meeting. Don't expect to get solutions to your concerns at this meeting. Use it to find out if the advisor can help you and if your personalities and work styles fit. For example, are you willing to let an advisor make investment decisions for you or do you want to retain control? Any other suggestions for my listeners on managing their finances? If your financial future is important to you, act like it. Most people spend more time planning their vacations then they do on their financial plans. Invest a little time reading up on the basics of financial planning and investing. You are not trying to become an expert but you can do a lot on your own to improve. Check out NEFE, newspaper columns, WIFE, Google basic financial planning, credit.com, FP Workbook for Dummies, Vanguard site basic informatives, and local college courses. I suggest you spend one hour a week reading on your financial future. When you are better informed, you will be better equipped to find help on the items you don't feel comfortable handling.